Toronto: Simon & Schuster Canada, c2018. I loved this book! I received a copy from the publisher shortly before the release last week, and settled in to read the whole book that night. Couldn't put it down. 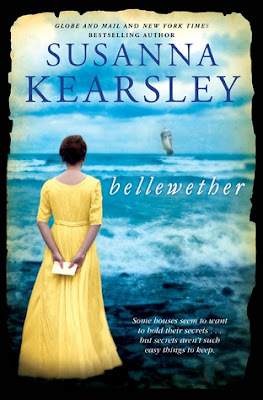 I love Kearsley's mix of history and romance and hauntings -- this book is one of the best of her most recent titles, for me, as it covers an area of history that I personally enjoy: it's set in 1759 during the war between France & England in North America. It takes place in Long Island, where the Wilde family (made up of father and grown children) must board two French officers who have been captured by the English. One of these officers, Jean-Phillippe de Sabran, is much more respectful of the Wilde family than the other officer, and his interest in their lives grows to include the woman of the house, daughter Lydia. The story is enriched by Kearsley's ability to sketch characters quickly, but with depth and interest. The romance in the past was more vivid than the current day one, for me, but I enjoyed both storylines. I really do like the New France era, and there was a lot of detail about the politics and daily life of that time, thanks to Jean-Phillippe. The house/museum itself is a lovely character, well drawn and described in both eras; I would visit it if it really existed. I also liked how the family relationships in both eras were important to the story; it's nice to see those kind of ties instead of an isolated main character who seems to exist independently. I can't say too much as I don't want to give away the unfolding of the plot and the joy of discovery while reading this, but I did think this was a great addition to Kearsley's novels, and certainly one that I will reread. The pacing, characters and setting all worked together wonderfully. If you are looking for a non-racy romance, a great historical setting, and a solid plot (with ghosts! ), you must try it. Well-done review! I actually generally don't like books with ghosts, but I very much liked this one. I'm glad you also enjoyed this one - she has a light hand with her ghostly themes. I'm so glad you enjoyed this book! I have a different one by Susanna Kearsley, on audio, The Winter Sea, in my car. I will start listening to it soon! I think you'll love it -- it's a good one! Oooh. This book sounds good. It sure is! So gentle and romantic and beautifully historical. I am at 172/13. My aim is to get close to that 200 mark again this year. Can I make it? The clock is ticking!